Two months can be a long time in the global gas market. In May Japanese buyers drove Asian spot LNG prices above $18/MMBtu as they competed to hedge their summer gas load against a backdrop of ongoing nuclear plant closures. Since May, Asian prices have plunged 25%, with spot cargoes changing hands below $14/MMBtu. It’s worth highlighting that the price drop has coincided with a sharp fall in crude prices. Long term Asian LNG contract prices are primarily indexed to crude benchmarks such as Brent, WTI or JCC (albeit with much simpler structures than European contract prices, with less reliance on multi month lagged averaging and all specified in a single currency: USD). As such, the current prices purchasers are paying under these contracts will also have fallen significantly. Any flexibility in these contracts can be arbitraged against available spot cargoes creating a direct link between contract and spot prices. There has been a notable absence of Chinese and Indian buyers of spot cargoes as prices have plummeted. We have already outlined evidence of stagnation in Chinese power and coal demand as industrial output and economic growth slowdown. Time will tell if this is symptomatic of a broader decline in energy demand from developing Asian economies. The price fall in Asia has coincided with the sale of new volumes of gas from new LNG projects coming online this year. Woodside’s Pluto project in Western Australia has now sent out 8 shipments since being commissioned in April. The Soyo project in Angola is also set to commence selling cargoes into the spot market over the next two months. These volumes are only the start of a surge in liquefaction capacity that is being developed for commissioning between 2014-16, although owners of the more expensive export projects in Australia must be watching the Asian spot price very nervously as it threatens their breakeven return. The Atlantic basin to Asian price arbitrage that opened up in 2011 has rapidly evaporated. Even a month ago there was no expectation that cargoes would flow back into North West European terminals for at least the rest of this year. But from mid-July both the GATE terminal in Rotterdam and Milford Haven in the UK are scheduled to receive multiple cargoes which had previously been intended for diversion to Asia. So what does this mean for the European gas market? An absence of emerging Asian LNG buyers in the face of a substantial volume of new supply raises serious questions about the robustness of Asian demand growth. It also indicates that the post-Fukushima divergence of Asian LNG prices from the European transport differential may have been a temporary factor that is now easing (as we have suggested would be the case previously). It will be interesting to see to what extent Asian prices recover into the coming winter. 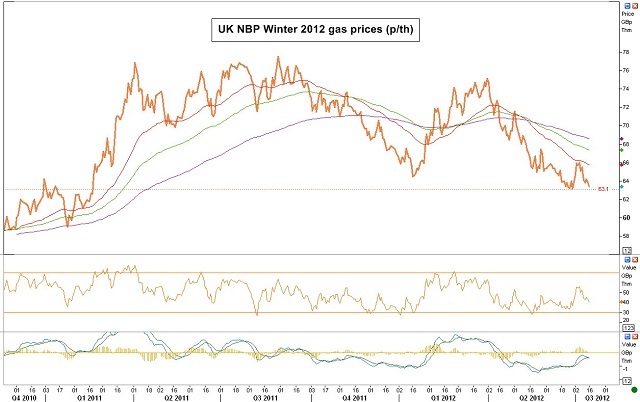 Chart 1 shows the evolution of the Winter 2012 NBP contract price. Concern over the impact of the eurozone crisis on NW European gas demand have been the main factor behind the price decline since March. There has been a broad based recovery rally in commodity prices since late June in response to a (temporary) stabilisation of the crisis in Europe. But the NBP curve participation in this rally has been muted by the fall in Asian LNG prices and the Winter 2012 contract is again testing 18 month lows. The flow of cargoes back into NW Europe terminals will continue to exert downward pressure on European hub prices as long as the differential between Atlantic Basin and Asian prices remains around current levels.